ECONOMY shows you how your speed affects your range. If you find your range needs extending, slowing down will do it. How much? Compare your range with the distance remaining to the pump, see RANGE TRAK. RANGE TRAK Think about when you come upon a road sign. You glance at The Trip Computer and see how many miles to empty. Instantly you know where to stop for fuel. If your range is close then Range Trak will keep tabs on how you are doing all the way to the pump. Range Trak tells you the difference in your range and the distance to the pump. Keep on the positive side and you will make it. Slow down if you go negative and it will come back. If you have a large margin you can ride harder if you want to arrive sooner by using up the margin while keeping your range in check. 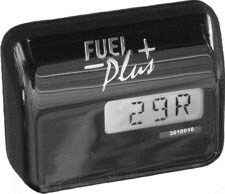 This will let you burn a full tank between fuel stops minimizing time between stops. Get that 1000 miles in 24 hours in minimum time. DAILY STATS are tracked and displayed for the current day. They are miles driven so far, running time, average speed excluding stops, and average speed including stops. The information is retained until the next day for recording and is reset when you first drive off. TEMPERATURE can be monitored at two points of your choice (air, engine, cooler, etc.) with high and low alarms. Fahrenheit and Celsius scales. Your battery is going to fail. When? The Trip Computer will let you know when. Your battery is load tested on every start to give early warning of low capacity or bad cable connections. The CHARGING SYSTEM is checked every minute. If a problem is detected the early warning will let you reduce your electrical load and give you time to find a safe place to pull over and investigate the problem. This could prevent a road side breakdown. At any time your battery and charging system can be read with the volt meter function. Your battery is going to fail. When? The Trip Computer will let you know when. Your battery is load tested on every start to give early warning of low capacity or bad cable connections. The CHARGING SYSTEM is checked every minute. If a problem is detected the early warning will let you reduce your electrical load and give you time to find a safe place to pull over and investigate the problem. This could prevent a road side breakdown. Set a distance to a highway junction, town, or a fuel stop. WAYPOINT will give the distance remaining as you ride. Set a pre-alert from one to twenty miles before the waypoint and The Trip Computer will change to the waypoint display, flash the display and the red LED at the pre-alert distance you have selected. Should you pass the waypoint because of a missing sign or other reason the waypoint continues to show the negative distance you have traveled past it. Beyond being a time piece the clock will tell you how long you have been riding from your last stop. It is easy to change one hour forward or back for time zones or daylight saving time. The clock can run in 12 hour or 24 hour mode. The Trip Computer is 100% accurate allowing you to use more of your fuel thereby extending your range when you need it or to reduce fuel stops. When YOUR gauge says empty The Trip Computer tells you what you really have. It´s more than you think! The Trip Computer adjusts to changes in wind load and speed. IF you chose to run to zero RANGE your engine will still be running, GUARANTEED! ALARMS occur when set points are exceeded. The battery load test will alarm after starting if the voltage drops below the set point. If the alarm is frequent you should have your service shop check for corroded or loose connections and test the battery. A charging circuit alarm means the alternator cannot keep the voltage up to the proper level. This could be from too much electrical load or the alternator is malfunctioning. In either case the electrical load should be reduced as much as possible. Watch the voltage on the meter to make your decision. Temperature alarms depend on what you are monitoring. If you don´t want an alarm then set it to the extremes. Operation is simple, when you fill up, a new range distance is displayed. Plan your next fuel stop without guessing. Use as many or as few of the functions The Trip Computer has to offer. The Trip Computer can be tailored to your motorcycle and your needs. Daily riding time and distance help you make route and time decisions along the trip. Set the trip odometer at the start of your trip, read any time during the trip and total miles on completion or use it to keep track of servicing. Use the factory trip odometer for marking junctions or short trips. RANGE TRAK can assist in making a long stretch near the capacity of your tank. Waypoint distance can alert you when you approach a junction. Any and all information can be read anytime by touching one of two invisible pads. How it works. When you refuel you must fill the tank FULL. The Trip Computer is manually reset to your full tank or on some motorcycles it is automatic. To operate The Trip Computer , touch one of two invisible pads on either side of the The Trip Computer logo to select the functions. The touch pads will work through winter gloves and are not visible to those who might want to tamper. The distance traveled is measured from speed signals on your motorcycle or from a speed pick up supplied with your unit. 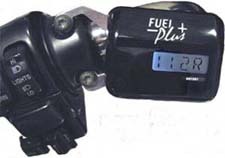 The Trip Computer measures the rate of consumption over a distance traveled and applies it to the fuel remaining in the tank. The Trip Computer keeps track of what´s in the tank by measuring it (by the drop) as it passes through the fuel injectors. This is what gives The Trip Computer its accuracy. It does not use the tank float for measuring the fuel like factory Trip Computers. The Trip Computer is weather proof and comes with mounting hardware. The display is back lit for night use. The back light is turned off during the daylight keeping it bright for many years. A bright red LED flashes for alerts and alarms. The case is made from polycarbonate, a material used for bullet resistant windows. The outside is polished and has no groves to collect dirt. The finish is internal and will never rub off. It has an internal heater to keep the display crisp and reduce fogging in cold weather. One year limited warranty to the original owner. The Trip Computer requires fuel injected engines. It can be calibrated to any size tank(s). Filling up to the factory specified FULL level is required. The Trip Computer supports miles, km, gallons, liters, Deg. F & C, 12/24 hour clock. The Trip Computer was designed and assembled in the US. The design contains industrial grade components to give many years of trouble free service. Conformal coating is applied to the circuit boards and dielectric grease used on contacts to keep out moisture. It is repairable should it need it. Note: The actual bracket holding the Trip Computer is black.